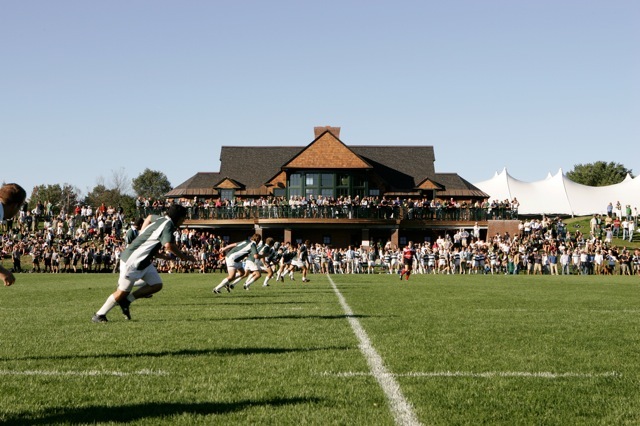 Cambridge, MA – Dartmouth faced off against Harvard this weekend in its first Ivy League game of the 2016 fall season. Looking for its first win of the season after two tough preseason losses, Dartmouth knew that it would be a big match as Harvard finished second in the Ivy League last season. At 65 and sunny the Big Green prepared for what seemed to be a perfect day of rugby. Dartmouth, while excited for the game, came out slow against Harvard. With a number of new players filling in at new positions, things seemed a bit off for the Big Green’s offense. A few knock-ons and some sloppy offloads held Dartmouth scoreless for the first 10 minutes of the half. However, Struan Coleman was able to get Dartmouth on the board with a hard run and give the Big Green a 5-0 lead. Just a few minutes later Dartmouth elected to kick for points off of a Harvard penalty and Dawit Workie drilled the ball through the posts extending the Dartmouth lead to 8-0. Unfortunately, Dartmouth was not able to keep its momentum going and closed out the half with a lead of just 8-0. The second half of the game started a bit better than the first. Dartmouth and Harvard exchanged a number of line breaks, however no one seemed capable of scoring. A gutsy grubber attempt from Harvard led to a Big Green lineout and a fantastic run from winger Max Parker. Dartmouth maintained possession of the ball and turned a scrum on the 5-meter line into Dartmouth’s second try of the game from Captain Hayden Aldredge. A conversion from Dawit Workie gave Dartmouth a lead of 15-0. An absolutely massive hit from football crossover Cody Fulleton injected some life back into Dartmouth and some fear into Harvard. Sloppy hands from Harvard led to another Big Green scrum with a few minutes left in the game. A terrific run from Luke Bienstock and then Jack Badenhausen led to another try for Dartmouth who extended its lead to 20-0. Dartmouth was able to hold Harvard’s offense as time expired and clinched its first win of the Ivy League season. Dartmouth will host Brown next week on October 1st as the Big Green will look to go 2-0 in the Ivy League.